The fast growth of Internet is creating a society where the demand on information storage, organization, access, and analysis services is continuously growing. This constantly increases the number of inexperienced users that need to access databases in a simple way. Together with the emergence of voice interfaces, such a situation foretells a promising future for database querying systems using natural language interfaces. We describe the architecture of a relational database querying system using a natural language (Spanish) interface, giving a brief explanation of the implementation of each of the constituent modules: lexical parser, syntax checker, and semantic analyzer. Androutsopoulos, I.: Intefacing a Natural Language Front-End to a Relational Database. M.Sc. dissertation, Dept. of Artificial Intelligence, Univ. of Edinburgh; http://www.dai.ed.ac.uk/papers/documents/mt92103.html. Cercone, N., P. McFetridge, F. Popowich, D. Fass, Ch. Groeneboer, G. Hall: The SystemX Natural Languaje Interface: Design, Implementation and Evaluation. Technical report, Centre for Systems Science, Simon Fraser University, British Columbia, Canada (1993); http://www.cs.sfu.ca/research/groups/NLL/4.html#4.1. Computational Linguistics Laboratory: Project Sylvia-NQL; http://www.lllf.uam.es/proyectos/sylvia.html. ELF Software: Hollywood Tutorial (1998); http://www.elf-software.com/Docs/Hollywood.htm. González, J.C., J.M. Goñi, A.F. Nieto. ARIES: a ready for use platform for engineering Spanishprocessing tools. 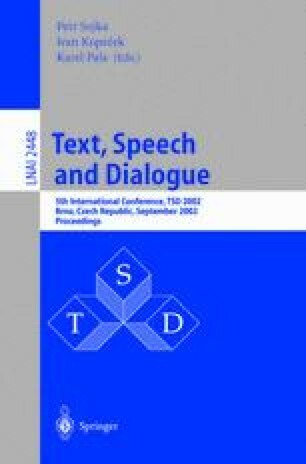 In: Digest of the Second Language Engineering Convention, London, U.K. (1995) 219–226; http://wotan.mat.upm.es/~aries/papers.html. Monedero, J., J.C. González, J.M. Goñi, C.A. Iglesias, A.F. Nieto: Obtención automática de marcos de subcategorización verbal a partir de texto etiquetado: el sistema SOAMAS. In: Proc. XI Congreso de la Sociedad Española para el Procesamiento del Lenguaje Natural (SEPLN’ 95), Bilbao, Spain (1995) 241–254; http://wotan.mat.upm.es/~aries/papers.html. Rodrǵuez S., J. Carretero: Corrector ortográfico de libre distribución basado en reglas de derivacióin. In: Primer Encuentro del Grupo de Usuarios de TeX Hispanohablantes (EGUTH’ 99) (1999) 44–52; http://www.datsi.fi.upm.es/~coes/publications.html. Ruwanpura, S.: SQ-HAL: Natural language to SQL translator; http://www.csse.monash.edu.au/hons/projects/2000/Supun.Ruwanpura. Validation and Business Applications Group: PASO-PC315 PROJECT, Generator of natural language databases interfaces; http://www.vai.dia.fi.upm.es/ing/projects/paso.htm.